The Tennessee basketball star is a favorite of fans both off and on the court, and wants to use his platform to make an impact on the community. KNOXVILLE, Tenn. — If Tennessee's Admiral Schofield didn't have such a strong future on the basketball court, he could make a living in the classroom! Every kid at Horace Maynard Elementary was riveted by the UT basketball star when he visited the school on Thursday. He got his usual cheers when his name was called, but this time when he ran into the gym it was to talk to the kids about getting a good education, working hard, and reaching their potential. Schofield wants to inspire these kids to make a difference. "I like doing a lot in the community, make an impact, use the platform I've established at the University of Tennessee," he said. 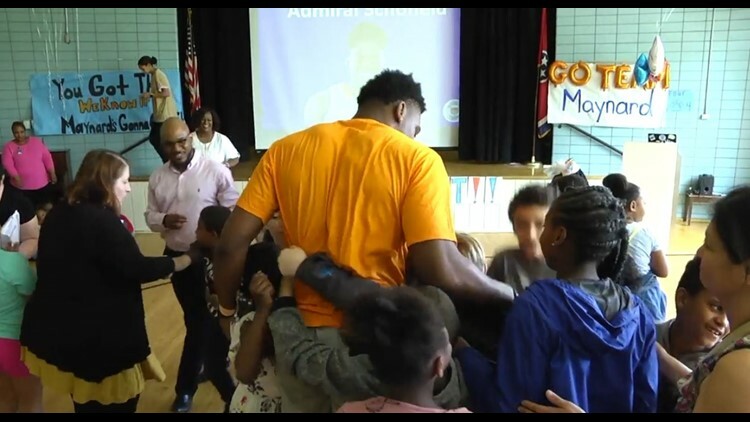 On a visit to Horace Maynard Elementary School, Tennessee basketball star Admiral Schofield is surrounded by kids after he talked to them. He seems to have a special gift when it comes to communicating, and a special connection to the kids. "It feels like yesterday I was in the same seats they were in," he said. "I want them to know there's more to life than being an athlete or a rapper, something like that. You can really chase your dreams and be whatever you want to be. It takes hard work and being educated." But it wasn't all serious. When Schofield took questions from the audience, one boy asked the tough question. "How good can I dunk," he laughed. "I can dunk on you!" Of course he had to show the kids, slamming the ball into the basket right there in the gym! The Admiral ended the visit with lots of hugs, surrounded by the little ones he hopes to inspire.